I found this recipe on Simply Recipes and tweaked it just a bit. The ingredients seemed perfect for the final course of a Thanksgiving meal. 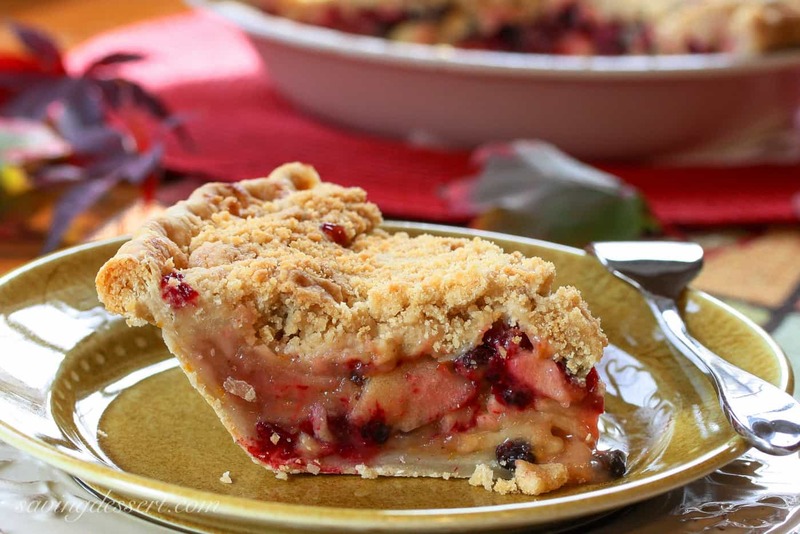 You can taste the tart apples, juicy cranberries, brandy soaked currants, and the sweet crunchy topping. 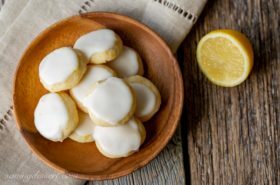 The other ingredient that really stands out is the orange zest. All the flavors really come through and all together they make a beautiful presentation. 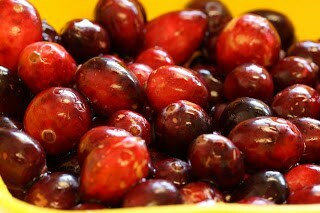 First you need to soak the currants in brandy for a least an hour or until they are plumped. 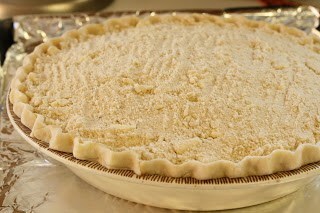 While they’re soaking, mix up a single unbaked pie crust in a deep dish 9 or 10 inch pie plate. Refrigerate crust while preparing the filling. Wash and pick over the fresh cranberries. Zest a fresh orange – you’ll need 1 tablespoon. 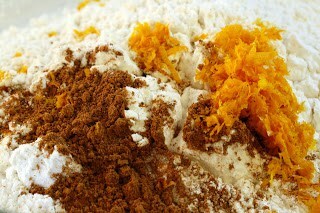 Mix the white sugar, 6 tablespoons flour, orange zest, cinnamon, nutmeg and salt together in a large mixing bowl. Set aside. Peel, core and slice 6 cups tart apples like Granny Smith. 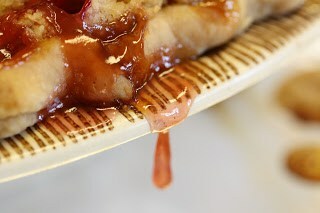 Add the apples to the sugar cinnamon mixture as you go to prevent browning. Once all apples are sliced, toss in the cranberries. Stir gently to prevent breaking the fruit. 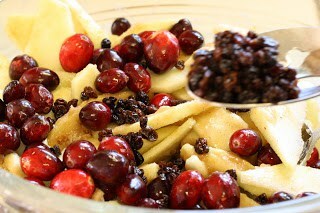 Using a slotted spoon, transfer the brandy soaked currants into the apple mixture. Hold on to the brandy – don’t pour it out! 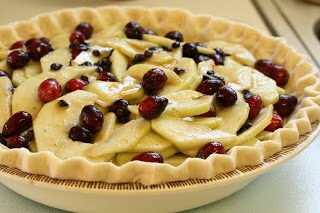 Pour the apple filling and any juices into the unbaked pie crust. Drizzle with the reserved brandy and set aside. In a medium bowl combine 1 cup of flour, 2/3 cup brown sugar and cut in 1/2 unsalted butter. Sprinkle the crumb mixture on top of the apple filling. Spread the topping to cover the pie. 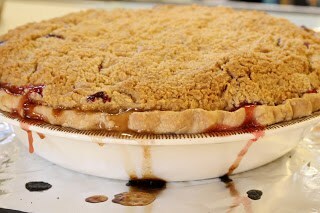 Place the pie on a foil lined baking sheet to catch any juices that bubble over. Bake at 375 degrees for 55-60 minutes on the bottom half of the oven. Cover with foil if the top begins to brown too quickly. If you use a dark brown sugar the crumb topping will be darker. 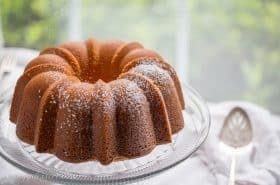 I used light brown sugar because that’s what I had in the cabinet. Juicy! Allow the pie to cool to room temperature. Serve slightly warm, cooled or refrigerate until needed. PIN to your favorite Pie Board! Mix and roll out a single pastry shell in a 9-inch pie plate. Refrigerate until ready to use. 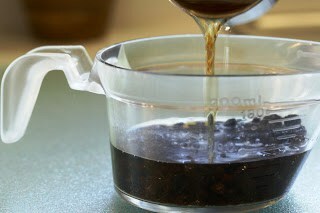 Mix the brandy and the currants in a measuring cup and set aside to soak until the currants are plump, about an hour. 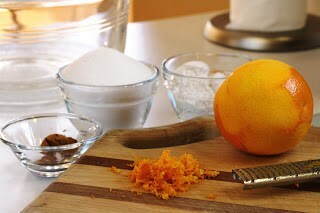 In a large mixing bowl combine the granulated sugar, 6 tablespoons flour, orange zest, cinnamon, nutmeg and salt. 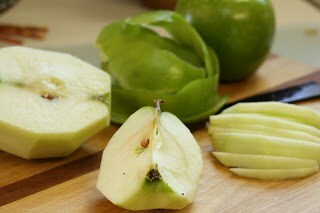 Peel, core and slice 6 cups of Granny Smith apples. Add the apples to the sugar cinnamon mixture and toss until well combined. Add the cranberries and stir gently to prevent smashing the fruit. 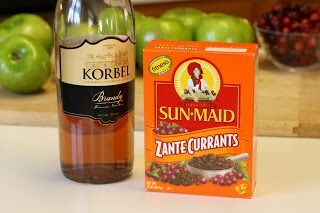 Drain the currants but reserve the brandy. 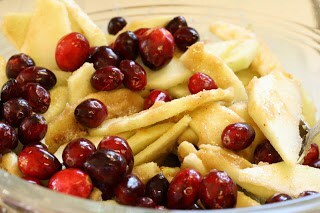 Add the currants to the apple mixture and mix gently. Pour the filling into the unbaked pie crust and drizzle with the reserved brandy. 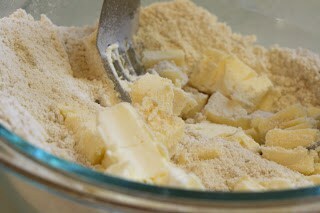 In a medium mixing bowl combine 1 cup all-purpose flour, 2/3 cup brown sugar and 1/2 cup unsalted butter. Blend until the butter forms small lumps. You can use your fingers or a pastry blender, whatever works best for you. 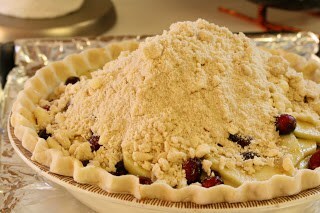 Sprinkle the crumb mixture on top of the filling and spread evenly to cover the top. 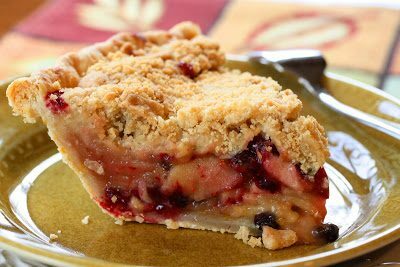 Place the pie on a foil lined baking sheet and bake for 55-60 minutes at 375F on the lower rack of the oven until the mixture is bubbly and the top is lightly browned. Cover the top with foil if the crumb mixture is browning too quickly. Cool the pie to room temperature and serve. Refrigerate leftovers. Thanks so much for stopping by! 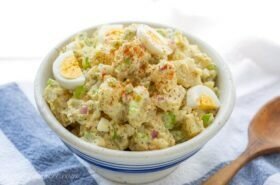 I’m off to continue a frantic search for my cornbread dressing recipe and must have lost it somewhere in the pile. If I ever find it I’ll post it before Thanksgiving. Hope you have a terrific week! Check back Wednesday for mouth-watering, soft dinner rolls that are so wonderful! 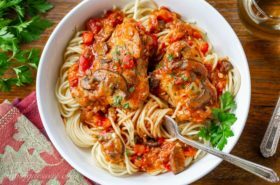 I’ve made this recipe a few times now and have never been disappointed. It’s well calculated and tastes amazing. I will add 2 T of bitters to the brandy and soak the currants and it adds a nice layer of complimentary spice. This screams AUTURM out loud! The pie looks exquisite! Tricia I am so thrilled you found me…I love cranberry pie, this looks fantastic! Hi Tricia! We love your desserts! 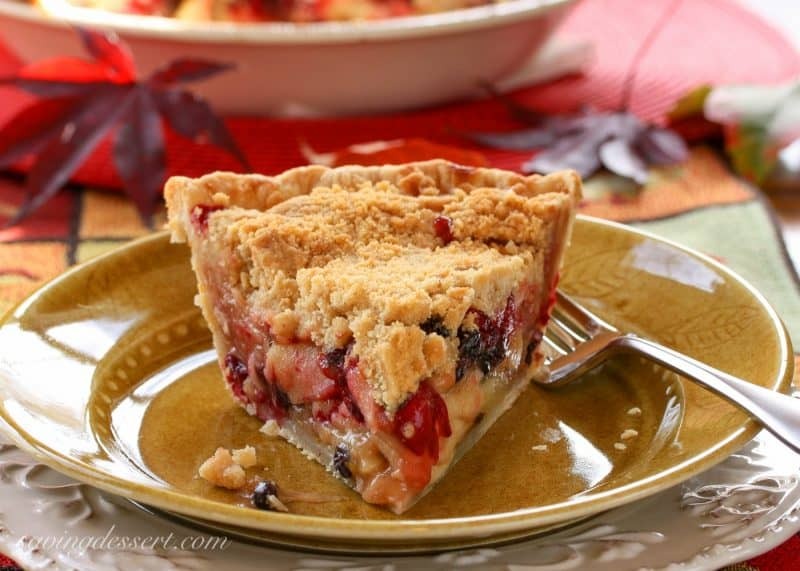 This is another great pie recipe from you and wonderful photos too! 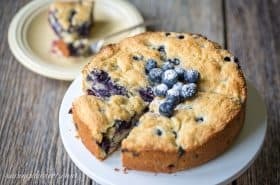 Wow that's a great looking pie! I might have to adopt this for my thanksgiving. We split up the chores amongst the family and this year I'm dessert guy and rolls, yes rolls so wheres that recipe? ?<br />Take care..